On Tuesday, December 12, 2017, Antibiotice was awarded the ANEIR Trophy of Excellence for its product Nystatin API, which, earlier this year, was selected to become an international reference standard by the United States Pharmacopoeia. The award highlights also two other important achievements of the company, namely the 50% increase of the Nystatin sales to the US and the recently started investment in a new manufacturing facility for ointments and suppositories. The Trophy was awarded during the ANEIR (National Association of Romanian Exporters and Importers) Gala held at the National Bank of Romania (NBR) in the presence of Mr. Mugur Isarescu, the NBR Governor, Mr. Nicolae Vacaroiu, a prime minister at the time ANEIR was founded, and delegates of the companies representative for the Romanian export. The prizes were awarded based on criteria such as the position in TOP 1000 exporters in 2017 of the National Institute of Statistics, the evolution from last year, the qualitative and quantitative performance of the exporters, presence in new markets, new products they sell internationally, increase in investments, efficiency/profit increase etc. 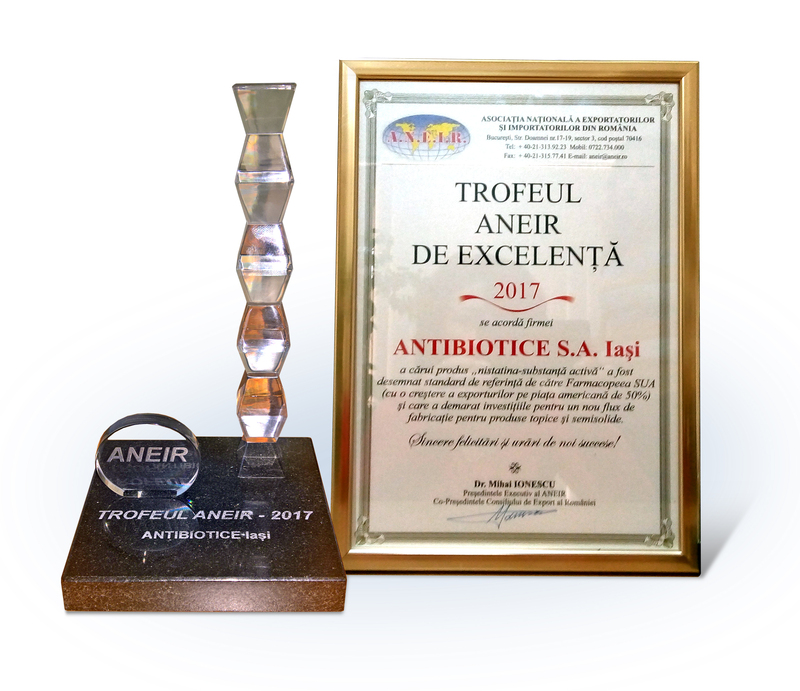 An award-winner at every edition of the ANEIR Gala, Antibiotice Iași has focused its last years’ international development policy on enhancing the commercial relationships, creating long-term strategic partnerships and opening new representative offices in territories of interest. “These aims are essential for the strategy of international business development of the company and for maintaining our competitiveness worldwide. We intend to consolidate our operations in the international markets by identifying new business opportunities and focusing on research and excellence in developing a product portfolio tailored to the requirements of the external markets”, declared Mr. Mihai Stoian, International Business Director. In the first nine months of 2017, Antibiotice’s international sales increased by 26% compared to the similar period of last year, amounting to 91.7 mil. lei. The main destinations of the products were Asia, North America and Europa, the sales in these areas accounting for approximately 80% of the total sales.